Trim both the ends off of the watermelon with a sharp knife. Place the watermelon onto a chopping board. Lay the melon on its side and use one hand to keep it steady. Trim off both ends of the watermelon with a knife. Slice the halves into slices. Place the cut side of the watermelon down onto the chopping board. 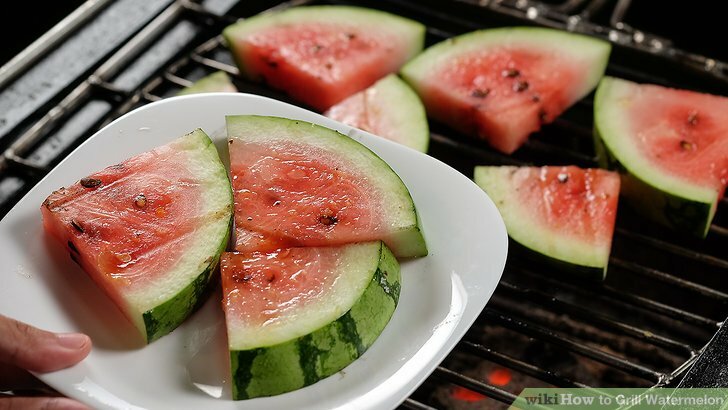 Cut the watermelon crossways into slices. Leave gaps between each slice. This depth of slice is ideal for grilling. Measure the sugar, lime zest, and pepper flakes into a bowl. Add ¼ cup (50 g) of sugar, (6 g) of lime zest, and 1/2 teaspoon (0.8 g) of red pepper flakes into a small bowl. This mixture creates a seasoning for the grilled watermelon.